Hi All, Here is my first try using Distress inks. I created a Simple Triple Stamping card for Scrapbook Blessings Challenge. I stacked up three panels of white cardstock and distressed the entire background using Broken China and Peeled Paint inks. I stamped the image and then layered the distressed card stock onto the black cardstock. I used Inkadinkado clear stamps for image and sentiment. To embellish it, I added liquid pearls and rhinestones ( I couldn't get better snap due to bad weather ). If you like this post, please follow my blog or subscribe to my blog by email / RSS. Feel free to leave your comments. I would love to hear from you. very sweet card ,love the layers and the swirls !! lovely stamping!! beautiful colors u have chosen... very nice !! 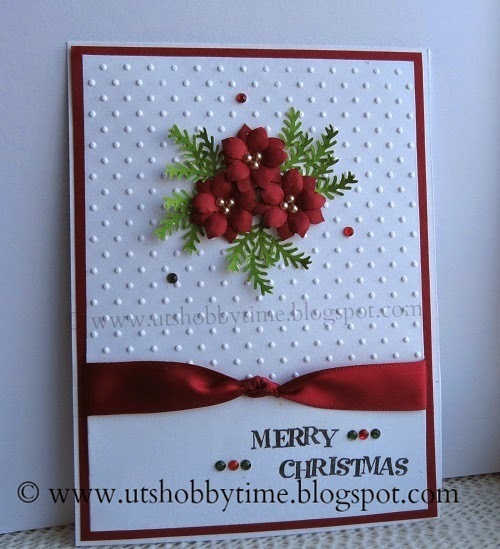 I loved the distressing n stamping both ,beautiful card ! This is so elegant. I like the layering up card stocks. And the embellishments are cute as well. This is gorgeous! Thank you so much for joining us at MIM! Remember, to be in the running to win the prize from our sponsor this week just leave a comment for another entry. Be sure to mention you saw them on Make It Monday. The more entries you comment on the more chances you have of winning! pretty card, luv the swirls...hope your weekend is grand! Love the layout of this card. pretty swirls and perfect little embellishments! Love the colors and swirls you have used! Thank you for participating in the Triple Time Stamping Challenge over at SBC. Very beautiful! Love your bling on the card! Thanks for sharing your talent with us at Scrapbook Blessings Club! Like your layered card. Very pretty. Well Done. I saw your card at MIM and had to stop by to take a closer look. Beautiful card ..thank you for joining TTCRD this week. lovely green card and nice arrangement on your card...lovely first try of the distress and nice combo between green n black...beautifully done..
Love your card and love the bling. Adds to the card. Love the distressing color combo, I am going to have to write that down! You card is just beautiful! Did you use a stencil for the pearl drops? Hi Sandy, Thank for your lovely comment. I didn't use stencil. The swirls were already there in the stamp. I just added liquid pearls to enhance the swirls. 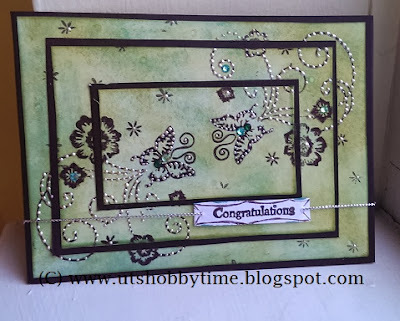 Beautiful card.. liquid pearls are cute..
Fabulous blending of distress inks, UT. Beautiful card! 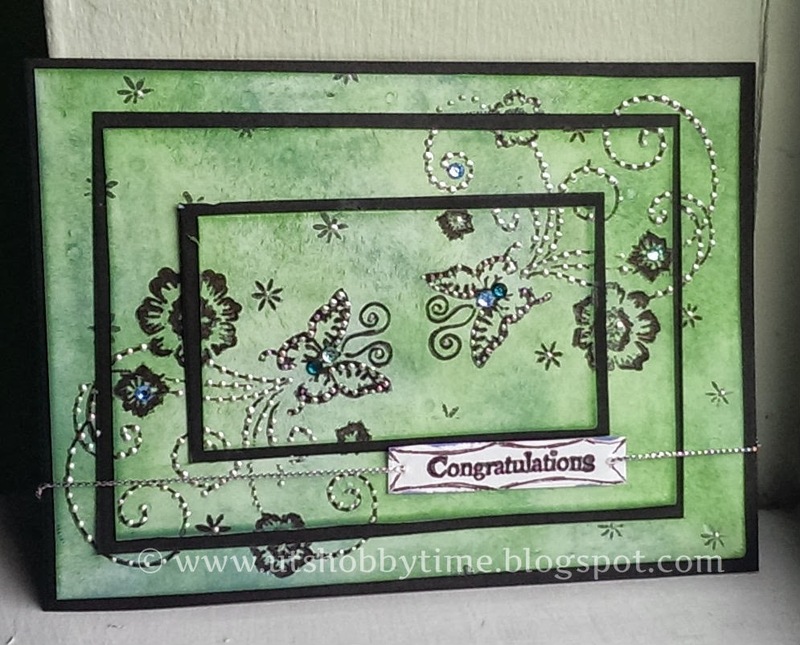 Such a pretty background with your inks and the triple stamping is fabulous. The pearls and rhinestones finished it off perfectly. It's a really interesting effect - thanks for sharing! 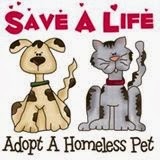 Feel free to leave your comments. I would love to hear from you. This blog participates in Amazon affiliate program. Compensated affiliate links are used whenever possible. Copyright © 2016 www.utshobbytime.blogspot.com. All rights reserved. Awesome Inc. theme. Theme images by merrymoonmary. Powered by Blogger.